When the criminal Clinton cabal announces that their infamous foe and now world renowned ‘basket of deplorables‘ are threats to their power establishment, you are really hearing an admission that they are losing the war of ideas. It has long been a well established fact that psychopaths on the loony left are existing in a parallel universe, but it is relatively new just how desperate they have become since the public is waking up to their century long scheme to destroy America. While more and more people are joining the cause of rational national self preservation, the task of mobilizing the ranks of long oppressed productive citizens is still in its infancy stage. Decades of mental manipulation has produced a cultural perversion of the most basic and fundamental values, which has transformed the country into a pig pin of apathetic hogs, who only know how to squeal for more “free” food and government entitlements. Those who reject this model of dependency are now called the Deplorables. The intensity of desperation coming out of the mass controlled media has the limousine liberals running on auto pilot to escape the wrath of the Trump supporters. Their only response is to trash the millions, who disdain the elitism within the heretical system of authoritarianism that the collectivists have created. Cal Thomas maintains, Hillary shows that she thinks of Americans as ‘deplorables’. Now being scorned by Marxists is certainly the opposite of being reprehensible, the establishment wants to rewrite history and interpose their distortion of events and reality on the general public by imposing a fictitious sense of falsehoods and phony guilt. The dismantling of institutions of time-honored principles of constitutional protections during the Obama years has provided a downward spiral in national pride and domestic prosperity. Clinton offers an even more destructive path to centralized despotism, based upon decades of her obfuscation, influence pedaling and treasonous dealings. Since an objective defense of such a record defies comprehension, all the Killery supporters can do is to attack the heartland of a country that they despise. Death follows the Clintons as sure as the corporatist media lies and protects her from endless scandals. Without accountability, there is no justice. For the “social warriors” from the totalitarian left, genuine fairness is a disposable commodity in a Machiavellian society of situation ethics. This is the reason why anyone who hold true to the timeless values of good as opposite to the expediency of evil, need to be labeled deplorable. Adi Robertson writes, Hillary Clinton exposing Pepe the Frog is the death of explainers is a prime example of how the frantic DemocRATS have reacted to Trump’s outreach initiatives to Blacks and Latino communities. Robertson then indicates the lack of substance in this approach to smear Trump, when the facts for such a contention simply do not exist. BATR is a proud part of the “so called” alt right. However, this publication has maintained a consistent America First populist advocacy for over sixteen years. Commenting on race, gender, immigration and Islam does not made a critic on society ‘racist, sexist, homophobic, xenophobic or Islamaphobic’. And if one dares to mention Jews or documents critical conclusion about Zionism, one is automatically defamed as a bigot or an anti-Semitic. Sure a cultural censoring is an abomination on scholarship, research, objective and truthful history. When an illuminati inspired globalist cabal responds to an authentic populist movement to overturn the strangle hold on legitimate national interests; international finance rallies around their latest Presidential puppet to sully the debate and distort the dialogue. 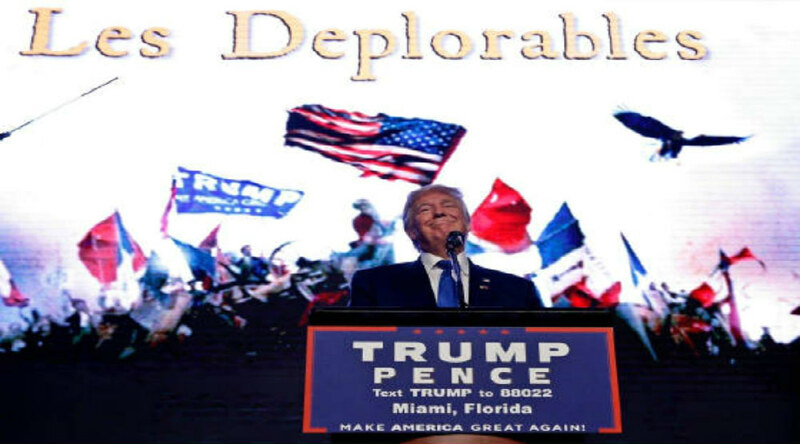 As the sickly Hildabeast is propped up to fend off a vigorous nationalist and patriot, Paul Hair argues, YOU’RE ‘DEPLORABLE’ BECAUSE HILLARY IS FUNDAMENTALLY EVIL. “Notice why Hillary put you in the Basket of Deplorables: you’re “racist” (you don’t hate whites), you’re “sexist” (you don’t hate men), you’re “homophobic” (you won’t bow down to the evilest of evils), you’re “xenophobic” (you resist aliens invading and conquering you), and you’re “Islamaphobic” (you don’t want terrorists murdering you). Hillary hates you for not being evil. And so does the rest of the Democrat-Media Complex. But beyond that, notice how Hillary says you are “irredeemable.” You’re on the side of good and for that you are forevermore her enemy. Hillary and the Democrat-Media Complex have a moral duty to do evil. They fundamentally hate you and want to destroy you. There is nothing you or anyone else can do to change this. This revelation is not new for seasoned political combatants. However, for the indifferent and detracted bystanders, who have yet to become an active Deplorable, the evidence cannot be clearer that an existential battle has risen to the surface in a country divided by the very essence of its being. Trump is not leading a second American revolution. Nevertheless, he has awakened sentiments and factions to conduct a nonviolent civil war on the establishment. The consolidation of opposition against this movement has been so exposed that no longer can excuses be made that the system can rehabilitate itself by reforms. Only by firing the careerist obstructionists and their reprehensible technocrats that push for greater global integration at the expense of national sovereignty, can the Deplorables regain their place in making America Great Again. The blowback from Hillary Clinton faces dilemma following ‘deplorables’ remark, has stirred the masses of ordinary voters. “At one event, Trump brought up nearly a dozen supporters of different races and backgrounds to make the point that Clinton has demeaned a broad cross-section of Americans because she thinks she’s better than them. “She divides people into baskets as though they were objects, not human beings,” Trump said to a group of national guardsmen in Baltimore this week. In the environment of the Clinton Foundation world view, these struggling souls are expendable, even if they did not cross the line to become a “Deplorable”. Keeping people in baskets of separation and limiting upward mobility is a cardinal concern for the elites, even if their rhetoric boasts of doing it all “For the Children”. Their Reign of Terror against the productive and independent is central to keeping the Potomac “Pols” in power. Trump policy announcements, while seldom reported or widely distributed by the presstitute crowd, who just went ballistic whenReporters Voice Outrage at Donald Trump’s “Bait-and-Switch” Press Conference, does resonate with the grassroots. When the pollsters call for input on Presidential preference, many Trump supports remain silent. The reliability of surveys is suspect because of slanted methods, biased samples and uncounted likely voters. As this campaign rolls to a stunning rush of Trump enthusiasm and a ground swell of newly motivated participants, the anxiety from the establishment will increase. With all the rumors of an October Surprise, you can bank on that the propaganda coming out of the Hillary robot will float their own version of drama, which will be based upon fantasy. Only a rigged election can stop a Trump victory. Rally all “Deplorables” to engage in election monitoring and become a poll watcher. Since many millennia’s reject a Hillary Clinton candidacy, use this opportunity to befriend a brainwashed creation of government schools and mass media trivia. Recruit into the ranks of the “Deplorable” brigade a future legion of America First citizens. The miserable performance from a lifelong second rate political liar does not warrant support by any rational person. Strip out the emotional deceit and stick with a robust and invigorating economic program that will enrich the entire country. Public outrage over Hillary’s remarks should be overwhelming. Those who see her as their champion are the real basket cases of political misinformation and duplicity.